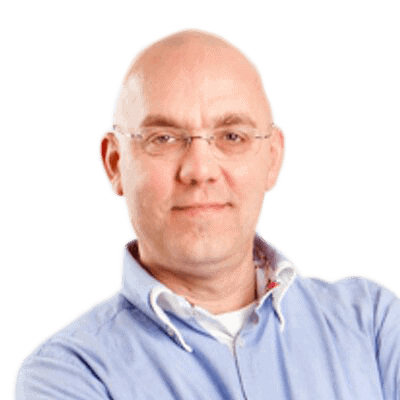 Jaap starts a series on the necessary steps to migrate an existing installation of Exchange to Exchange Server 2007. Of course it's simple! Everybody says so, but it is in the detail where you can get caught out. the option to connect your PABX infrastructure to your messaging infrastructure. Currently, I’m involved in consolidating and centralizing a 25.000-mailbox Exchange system and upgrading it to Exchange Server 2007. The customer intends that this new Exchange Server 2007 environment should be the foundation for their Unified Messaging infrastructure. There are several papers available on the Internet about making the transition to Exchange Server 2007 that imply that it is a simple operation: But is it really that simple? Suppose we have an existing Exchange Server 2003 setup that consists of several mailbox servers in different places. There are also two Exchange servers configured as ‘front-end servers’. These servers are basically the same as the mailbox servers, but they are configured as protocol proxy servers. SMTP, Outlook Web Access, and Activesync traffic originating from Windows Mobile devices, all enter the Exchange organization on the front-end servers. The front-end servers do not host mailboxes or public folders. To provide a higher scalability the front-end servers can be placed into a Network Load Balancing (NLB) cluster where the load from all clients can be spread across several front-end servers. These servers then use one common namespace, for example webmail.inframan.nl. The Exchange Server 2003 environment is running on a Windows Server 2003 environment in a single forest, single domain configuration. The Active Directory domain is running in Windows Server 2000 native mode. 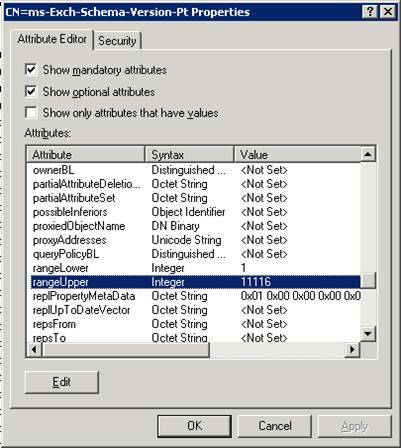 Internal Outlook 2003 clients connect directly to the Exchange Server 2003 mailbox server using the default MAPI protocol. The server that is hosting the user’s mailbox is configured in the profile that Outlook 2003 is using. Laptop users can either use a VPN connection to connect to the internal network or use the ‘RPC over HTTPS’ functionality in Outlook 2003. A couple of clients are also using Outlook 2007, but, because only Exchange Server 2003 is used in the company, any additional new functionality such as ‘Autodiscover’ or the new ‘Exchange Web Services for free/busy or Out-of-Office functionality’ are not available. Home PC’s can use the Exchange Server 2003 Outlook Web Access. PDAs use the company’s preferred mobile carrier to access the Exchange Server Activesync service. To provide a secure connection from all outside clients, an SSL connection is used for all clients. This is a simple SSL certificate with a single name: https://webmail.inframan.nl. If you are using Windows Mobile for Activesync in your Exchange environment, please make sure that the certificate you’re using is a supported one. Some vendors offer certificates that are working fine with websites and are fully supported by all kinds of browsers, but have issues with Outlook RPC over HTTPS and Windows Mobile. But if you’re using a known certificate, in this example from Digicert, RPC over HTTPS and Windows Mobile work great. In the Exchange 2003 organization there’s one Administrative Group. An Administrative Group is a management boundary. With Administrative Groups you can use ‘delegation of control’. Suppose there are multiple messaging departments in your organization, and each department has control over its own Exchange Servers. In this case you can use multiple Administrative Groups, one for each department. Every messaging administrator in a department has full control over his own Exchange Servers, and not over other departments’ Exchange Servers. Exchange Server 2007 also uses a different administration model and uses a different routing model. This means that Exchange Server 2007 can cooperate with Exchange Server 2003, but it may require some significant changes to your environment. The Active Directory domain needs to be upgraded to include Exchange Server 2007 permissions and system objects. 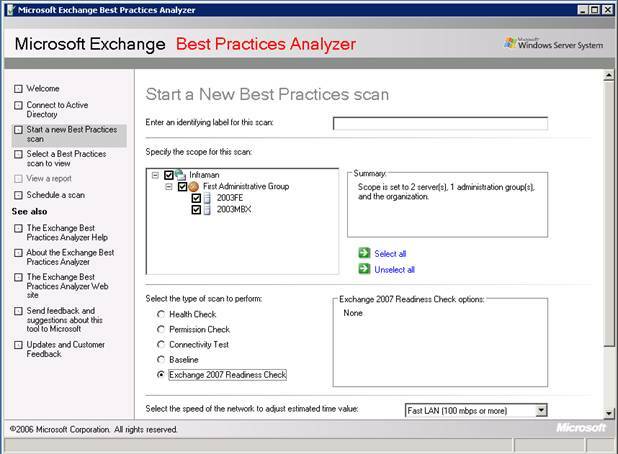 When you have performed these steps it is a common best practice to run the Exchange Best Practices Analyzer (ExBPA) and perform an ‘Exchange 2007 Readiness Check’. This will check the current infrastructure for its readiness for Exchange Server 2007. ExBPA can be downloaded from the Microsoft website or from Microsoft Exchange Analyzers. When ExBPA confirms the readiness you can proceed with the actual configuration changes and installation of Exchange Server 2007. The first command with the /PrepareLegacyExchangePermissions ensures that the Recipient Update Service in Exchange Server 2003 continuous to run correctly after the schema change to Exchange Server 2007 by granting new permissions. This must be performed before the actual upgrade of the Schema, which is done with the second command. Note. If you have multiple domain controllers in your Exchange Server environment you have wait for the Domain Controller replication to finish. 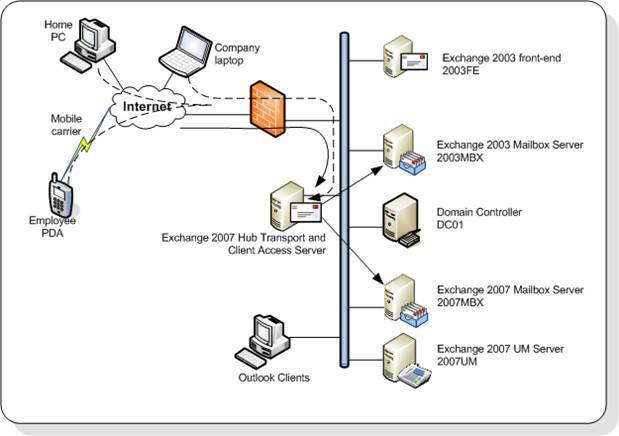 Running this command wil configure the global Exchange objects in Active Directory (residing in the Configuration container of Active Directory), creates the Exchange Universal Security Groups in the root of the domain and it prepares the current inframan.local domain for Exchange Server 2007. This command also creates the Exchange 2007 Administrative Group called ‘Exchange Administrative Group (FYDIBOHF23SPDLT)’ and it creates the Exchange 2007 Routing Group called ‘Exchange Routing Group (DWBGZMFD01QNBJR)’. After performing this step the new Administrative Group will show up in the Exchange System Manager on an ‘old’ Exchange Server 2003 machine (Figure 5). This step sets permission on the Exchange Server container in Active Directory and it creates a new Global Group called ‘Exchange install domain servers’ in the domain where the command is run. It also assigns permissions for the Exchange Servers Universal Security Group (USG). After performing these steps the Active Directory and Exchange Server environment is fully prepared for the installation of the first Exchange Server 2007 server. Installing the first Exchange Server 2007 server should be done carefully since Exchange Server 2007 is fully compatible with Exchange Server 2003, but not vice versa. This means that Exchange Server 2007 CAS and Hub Server can work with Exchange Server 2003 mailbox servers, but Exchange Server 2003 front-end servers cannot work with Exchange Server 2007 mailbox servers. This automatically means that when installing multiple Exchange Server 2007 servers in the Exchange Server 2003 environment the first Exchange Server 2007 server that will be installed needs to be a Client Access Server and a Hub Transport Server. In our scenario we will also install a dedicated Mailbox Server role as depicted in Figure 6. Figure 6. The Infrastructure with the Exchange Server 2007 coexistence. IIS 6.0 for the Client Access Server role. If only a Hub Transport Server is installed the IIS6 component isn’t needed, although installing it is useful for management purposes. During the installation the setup program will ask where to connect to the existing infrastructure. A little background: Exchange Server 2007 will be installed in a separate Administrative Group in the Exchange organization. Exchange Server 2007 does not use the routing infrastructure that Exchange Server 2000 and Exchange Server 2003 used for routing messages; instead it relies on Active Directory Sites and Services. This is the same routing infrastructure Windows uses for Active Directory replication traffic. The Exchange Server 2007 routing model and the Exchange Server 2003 routing model are not compatible, so Exchange Server 2007 has a legacy Routing Group, just for connecting with an existing Exchange Server 2003 Routing Group. When this question is presented the answer is used for creating the legacy Routing Group Connector between Exchange Server 2003 and Exchange Server 2007. Using this connector messages will be routed between Exchange Server 2003 and Exchange Server 2007. 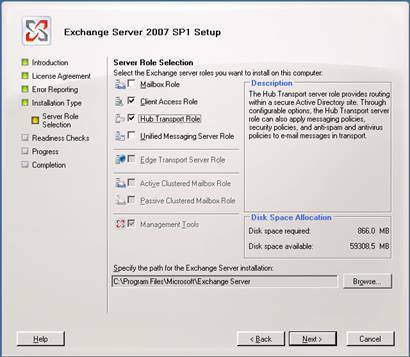 After installation of the Exchange Server 2007 Hub Transport and Client Access Server inbound messages will arrive on the new Hub Transport Server. Since all mailboxes still reside on the Exchange Server 2003 mailbox server all messages will be relayed to this server via the legacy Routing Group Connector. As soon as you implement Exchange 2007 and start migrating mailboxes to the new mailbox server, Outlook 2007 will notice immediately. Outlook 2007 has new functionality called autodiscover and Exchange Web Services. When starting Outlook 2007 it will query Active Directory for a Client Access Server object called the Service Connection Point (SCP). You have to be very carefull about the order in which to install the various server roles. The services mentioned in point 1 are all HTTPS based services. Even when you don’t use RPC over HTTPS (aka Outlook Anywhere) at all, Outlook 2007 will use these services over HTTPS. So, the first server that we are going to install is a combined Hub Transport Server and Client Access Server. There are two ways to install an Exchange Server 2007, via the command line or using the GUI setup. Both can be started from the root of the installation media. The advantage of the command line is that you can script it, which makes it possible to install a larger number of servers in an identical manner. When the installation is finished the first Exchange Server 2007 is installed and the server object is configured in the Active Directory. Outlook 2007 will immediately notice this and start using the Client Access Server. The next step is to configure certificates for the Client Access Server. The name of the certificate can be webmail.inframan.nl, just like the Exchange Server 2003 front-end server. 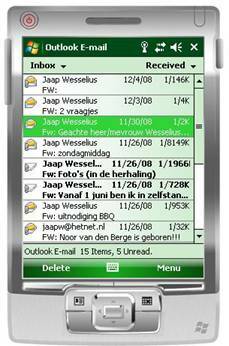 But Outlook 2007 and Windows Mobile 6 can also use the autodiscover functionality. Outlook 2007 will setup an additional connection to the Client Access Server via autodiscover.inframan.nl. This is an HTTPS connection, so it needs a certificate. To use the same Client Access Server a so called ‘Unified Communications’ or SAN (Subject Alternate Name) certificate needs to be used. This type of certificate can have multiple names. Besides the external names you should also register its internal name. When clients connect to the Client Access Server from the internal network the name of the Client Access Server can be resolved to its internal name, like 2007CASHUB.inframan.local. This command will generate a certificate request file that can be submitted at your own certificate authority. Import-ExchangeCertificate -path c:\newcert.cer | Enable-ExchangeCertificate -services "iis, smtp"
This will automatically install only the Mailbox Server role on the particular server. The setup will automatically detect the existing Exchange 2003 environment and configure itself accordingly. When the setup is finished there will be a fully functional Exchange Server 2007 environment integrated in the Exchange Server 2003 environment. Please note that Exchange Server 2003 as well as Exchange Server 2007 need to be managed with their own management tools. Exchange Server 2003 need to be managed with the Exchange System Manager, the Exchange Server 2007 need to be managed with the Exchange Management Console or the Exchange Management Shell. In my next article I will explain a bit more on the coexistence phase with the two versions of Exchange, how to move mailboxes from Exchange Server 2003 to Exchange Server 2007 and how to decommission the Exchange Server 2003 environment. i am working as an exchange administrator. right now i have to upgrade exch 03 to exch 07.
i know how to upgrade from exch 03 to exch 07. BUT i have a specific design and i donot get any material for that. 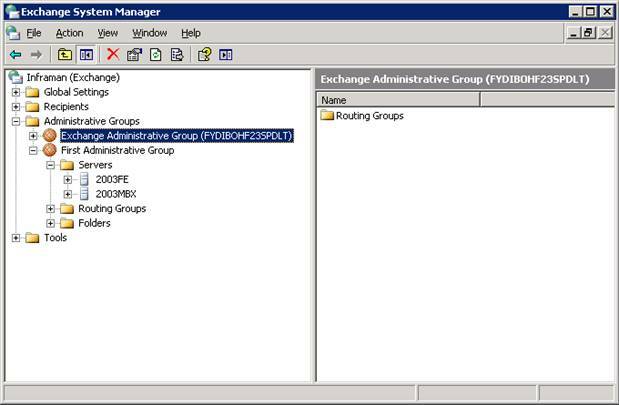 my exchange 2003 orgaisation has 2 AG and each AG has one exchange 03. i have 1 active directory site. i have 2 RGC to connect 2 AG’s exch 03.
mail flow is fine between them. now i have to upgrade to exch 07.